I love digging back into my recipe archives for treasures each week and this week I came across this recipe for pecan bars I knew I had to re-share. 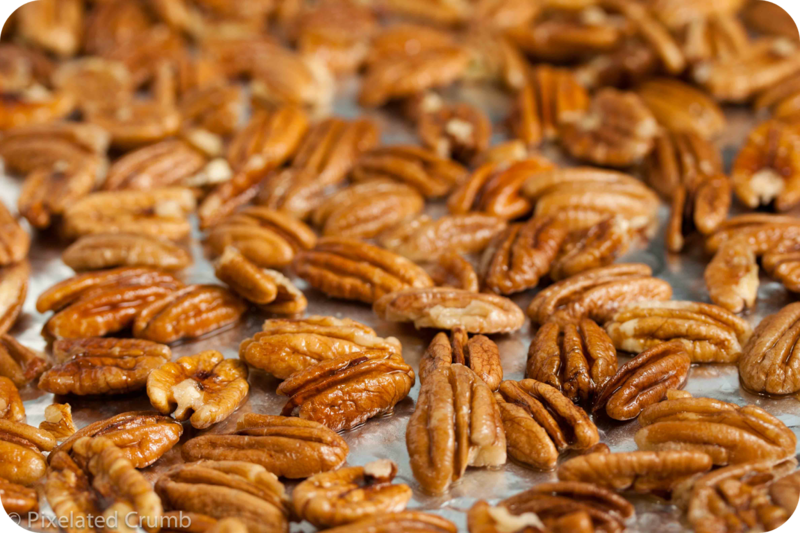 My mother-in-law loves pecans and not only did I want to share this recipe with you again, but I wanted to unearth it so I could bake up a batch for her Mother's Day gift, so its a win-win! The original recipe came from the blog "The Slow Roasted Italian". The original recipe makes a ton of bars and I've adapted it to fit in an 8x8 pan, which is the perfect size for gifting. The bars turn out perfectly every time I make them - sweet and gooey with the perfect blend of crunchy pecans and soft crust. Preheat the oven to 350 degrees. Beat the butter and granulated sugar in the bowl of an electric mixer fitted with a paddle attachment, until light, approximately 3 minutes. Add the egg and vanilla, mixing well. Sift together the flour, baking powder and salt. Mix the dry ingredients into the batter with the mixer on low speed until just combined. Line an 8x8 pan with parchment paper and lightly grease with cooking spray. Press the dough (it will be sticky, so flour or spray your hands first!) into the pan, making an edge around the outside. Bake for 10-15 minutes until the crust is just set but not browned. Allow to cool while you make the filling. Combine the butter, corn syrup and brown sugar in a heavy-bottomed saucepan. Cook over low heat until the butter is melted, using a wooden spoon or heatproof spatula to stir. Raise the heat and boil for 3 minutes, then remove from heat and stir in the heavy cream and pecans. Pour over the crust, trying not to get the filling in between the edge of the crust and the pan/parchment paper. Bake for 20-30 minutes until the filling is set. Allow to cool, then wrap in plastic wrap and refrigerate until cold before cutting into bars and serving.